Dum Aloo Baingan recipe by lifelongpk at DesiRecipes.com. Wash the brinjals 2-3 times properly to wash out all the salt . Heat the oil, put mustard seeds in it. Once they start to simmer add bringals, red chilly powder, haldi , ginger garlic paste and stir them till they are fried. Add a little water and cover the pot. After about 5 minutes, add potatoes and cover again for 10 minutes. 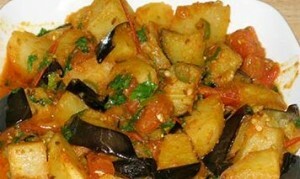 When they are tender, separate the potatoes in a dish and add cut onions and green chillies in the bringals. Add 1 table spoon of oil and fry them properly. Leave the onions and chillies cruncy for better taste. Now add the potatoes and cover the pot for another 5 minutes. Sprinkle lemon juice before serving hot with chappaties/naan. I just tried it today and the taste and freshness is amazingly good. Recommend it.